Cats, together with the jack-o-lantern pumpkins and monsters, have been associated with Halloween for the longest time. 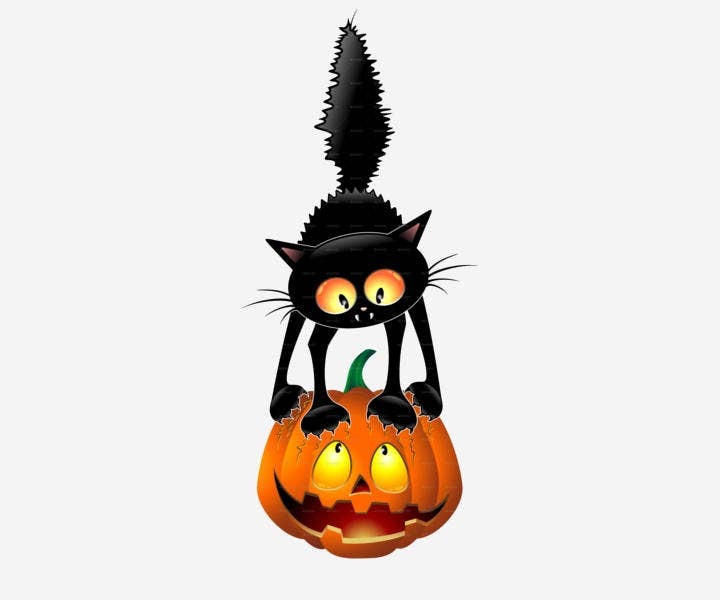 Although not as iconic as the pumpkin or witch, cats (specifically black cats) still form part of Halloween symbolism just like the pine trees for Christmas or eggs for Easter. 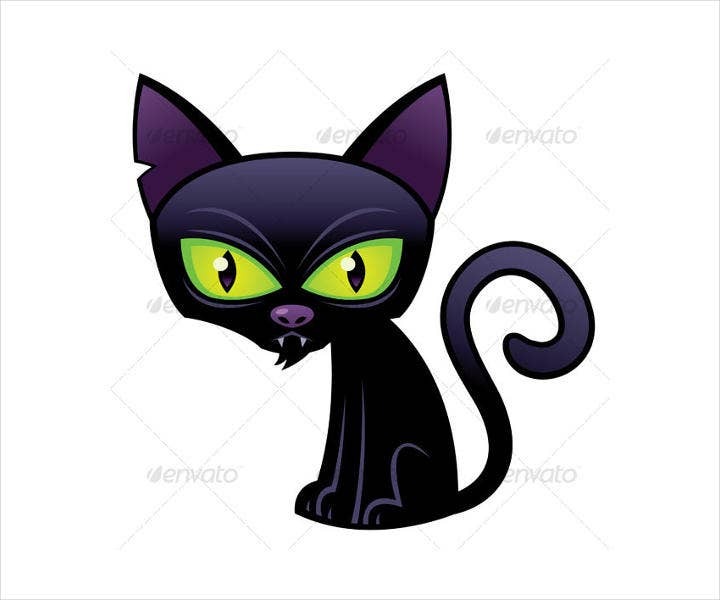 Black cats became associated with Halloween as legend and superstitions narrate that black cats cause bad luck while also being disguises for witches. Halloween designs don’t only involve pumpkins. A variety is needed to increase visual appeal and also bring excitement to people during Halloween season. Halloween is only a few days away and the world will be again celebrating this scary yet enjoyable holiday. 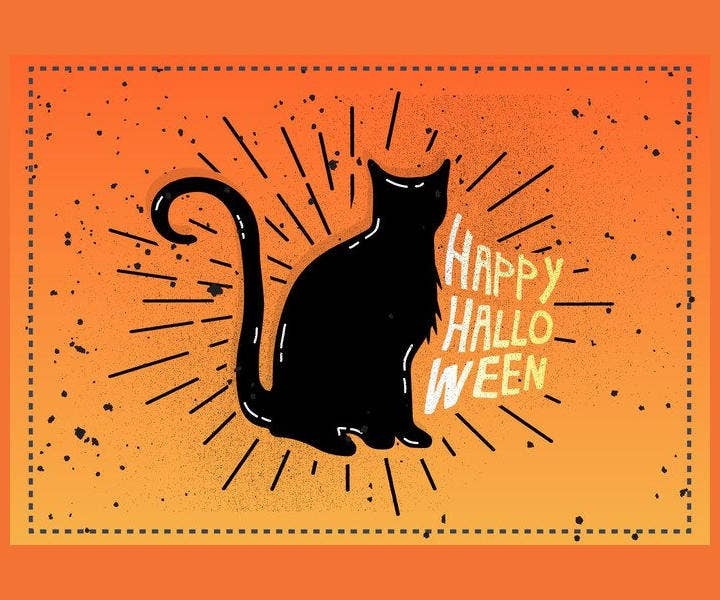 If you are planning to host parties or events, check out these Halloween cat templates for your invitation design, flyer templates, and the like. Change up your design and steer away from the typical jack-o-lanterns and use these cat-inspired Halloween templates. Additionally, take a look at our Halloween bats and Halloween pumpkin templates. 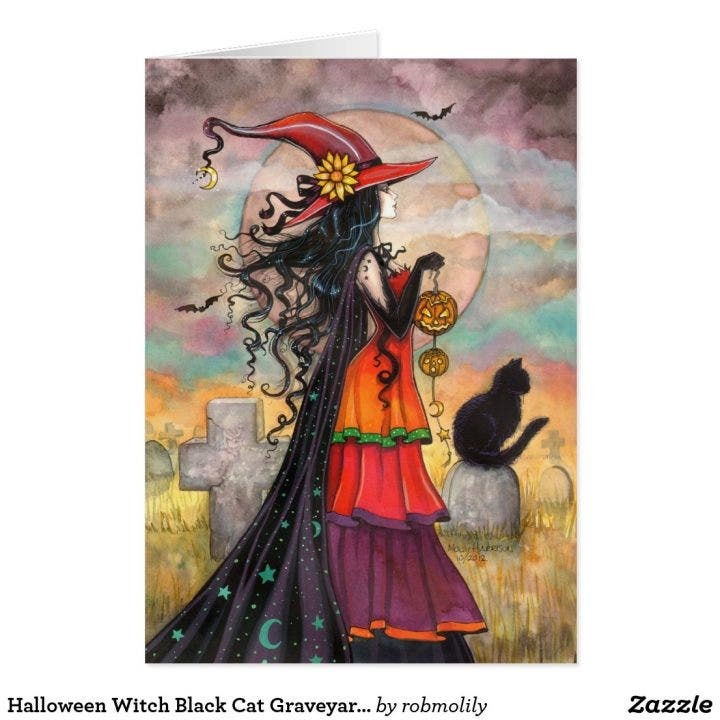 Purchase this witchy Halloween clip art collection composed of 52 PNG illustrations. 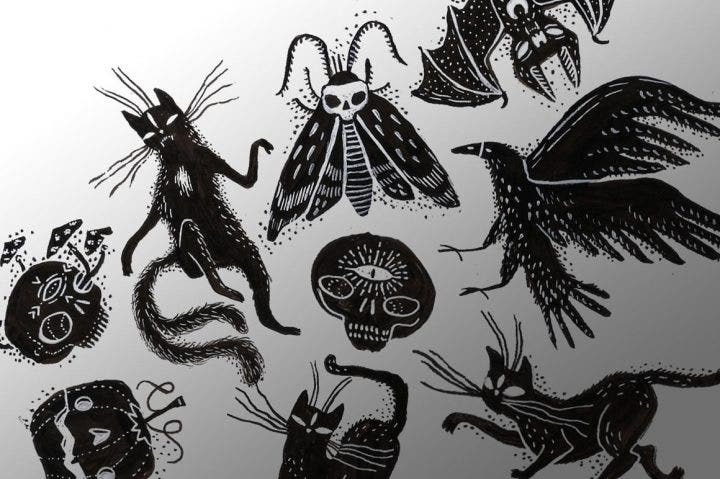 The clip art collection includes witchy silhouette, vampires, skeletons, ghosts, pumpkins, witchcraft tools, mushrooms, demons, bats, haunted houses, and, of course, black cats. 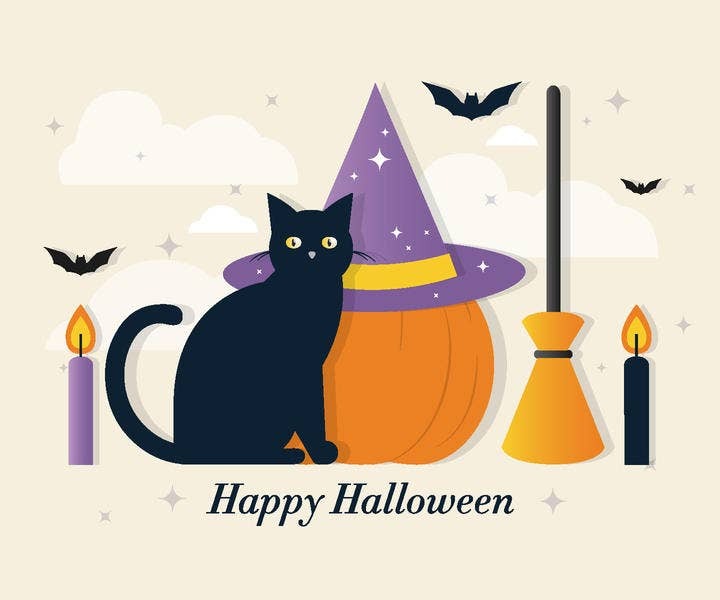 This collection has a variety of Halloween-related images you can use for your Halloween design. Two transparent background PNG illustrations are also included. If you want to hand out some souvenirs to guests after your event, purchase these creepy yet beautiful black cat gargoyle postcard design. The design of this postcard perfectly resembles the terrifying aspects of Halloween. A cat with gargoyle wings is not something you want to mess with. The hand-painted effect adds to the beauty of this postcard, creating a vintage feel to this template. This postcard is highly recommended to purchase this Halloween season. This postcard template has a 4.25″ x 5.6″ (portrait) or 5.6″ x 4.25″ (landscape) size, full-color CMYK print process, and double-sided printing for no additional cost. This six black cat set is ideal for your Halloween event design. Choose from the set featuring a Frankenstein cat, Dracula cat, witch cat, gargoyle cat, skeleton cat, or mummy cat. You can also use all six cat images in your own design. 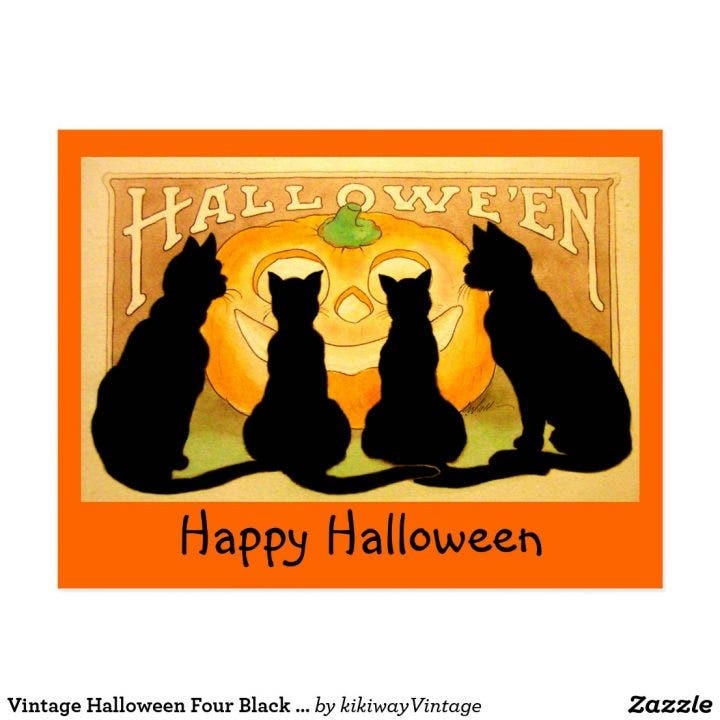 Here is another highly recommended Halloween cat postcard template. Give this postcard as souvenirs to your guests or post them in the walls in your office, restaurant, bar or any venue where you will be holding your Halloween invitations. Although not as intimidating as the previous template, this postcard has an image of cat silhouettes and a pumpkin combines still has a very attractive look. 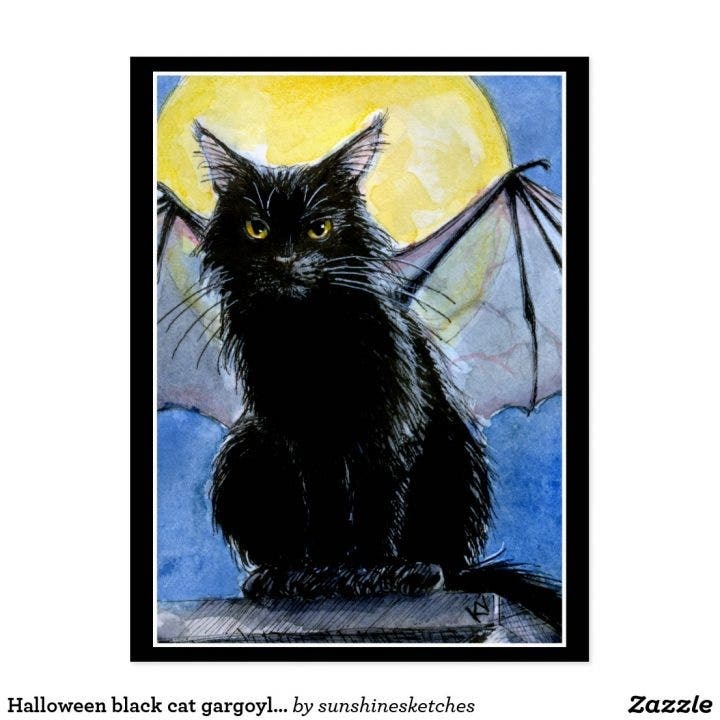 The pumpkin coloring page in the background complements well with the cat shape images. 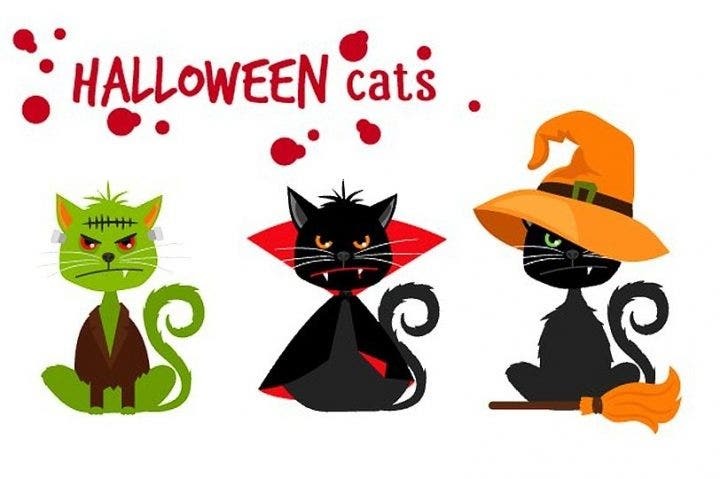 Since black cats are mostly used for Halloween, it is highly recommended that other details in the design have different colors to balance with the black color. This postcard template also has a 4.25″ x 5.6″ (portrait) or 5.6″ x ￼4.25″ (landscape) size, full-color CMYK print process, and double-sided printing for no additional cost. Sometimes, a little humor is needed for Halloween designs to be fully appreciated. Just like horror movies, the best films are the ones which show a little bit of humanity which includes laughter and joy. Horror movies which show 2 hours of non-stop screaming and bloodshed are just too depressing. 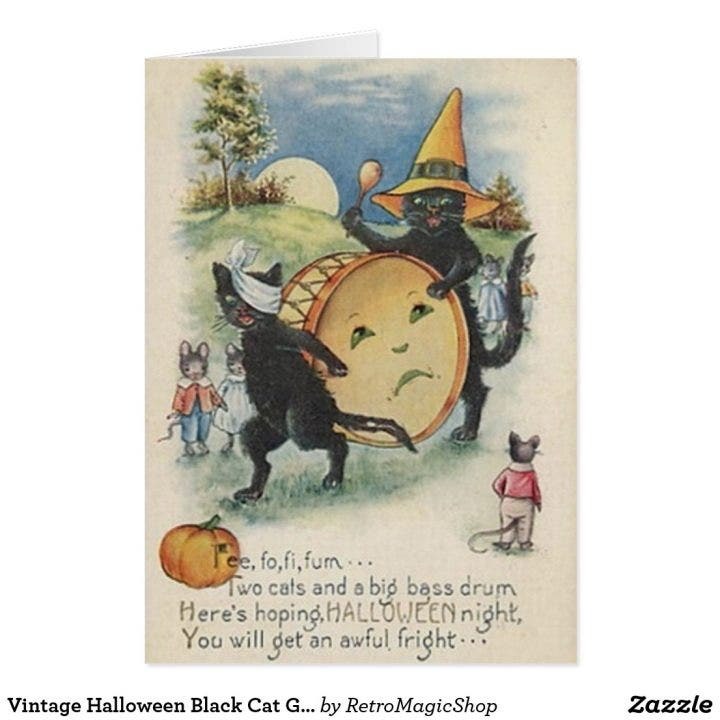 A little bit of humor is injected in this Halloween cat greeting card as two cats are parading around the street carrying a big drum. One cat has a bandage wrapped around its left eye while the other cat is enjoying itself beating the drum. Mice can also be found in this greeting card template as they surround the background. The dimensions of this template are 5″ x 7″ (portrait) or 7″ x 5″ (landscape). This template also has a full-color CMYK print process, all-side printing for no additional cost. The printable area on the back of the card is is 3″ x 4″ (portrait) or 4″ x 3″ (landscape). Standard envelopes are included. If you have ever played or encountered the video game Final Fantasy, then you would get an idea where the design for this personal card template came from. A very detailed hand-painted design is used for this Halloween, a perfect gift for guests after visiting your Halloween event. This is not your typical disfigured, ugly, and terrifying witch. What you get instead is a beautiful woman silhouette wearing a witch hat and a long colorful gown. Don’t be deceived by her looks as she is still a witch and her cat is watching nearby. Although the cat doesn’t take all the attention in this card template, it still has an integral part in the overall design. This template has a dimension size of 5″ x 7″ (portrait) or 7″ x 5″ (landscape), full-color CMYK print process, and all-sided printing for no additional cost. The printable area on the back of the card is 3″ x 4″ (portrait) or 4″ x 3″ (landscape). This Halloween card template is truly terrifying. If one black cat doesn’t scare you, try 16 black cats. Although one image of a cat is used, the same cat image is duplicated 15 times with the angles being changed. A photo of a forest during sunset is used in the background. Although this template will send chills down the recipient’s spines, they will also appreciate the beauty and art being placed into the design. This is another card you can give out to your guest list after your Halloween party. This template has a 5″ x 7″ (portrait) or 7″ x 5″ (landscape) size, full-color CMYK print process, all-sided printing at no additional cost. Printable area on the back of the card is 3″ x 4″ (portrait) or 4″ x 3″ (landscape). Standard white envelopes are also included. Halloween doesn’t need to be very serious and terrifying. 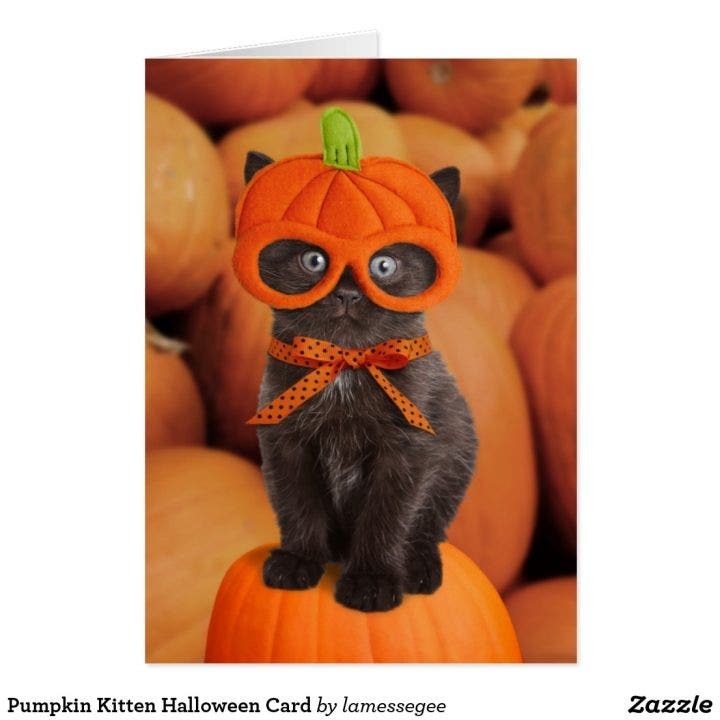 Similar to this pumpkin kitten Halloween card, designs can also be cute and funny. 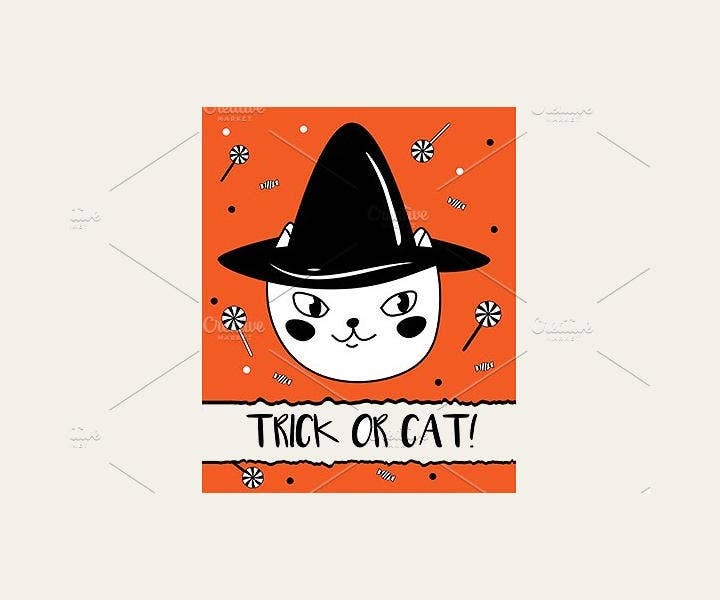 Any form of bad luck is removed from this Halloween card template as a cute kitten wearing a pumpkin hat provide the template’s main design. The dimensions of this template is similar to the other templates (5″ x 7″ for portrait or 7″ x 5″ for landscape). This template also has a full color CMYK print process and all-sided printing for no additional cost. The printable card on the back of the card is 3″ x 4″ (portrait) or 4″ x 3″ (landscape). Standard white envelopes are also included when you purchase this template. 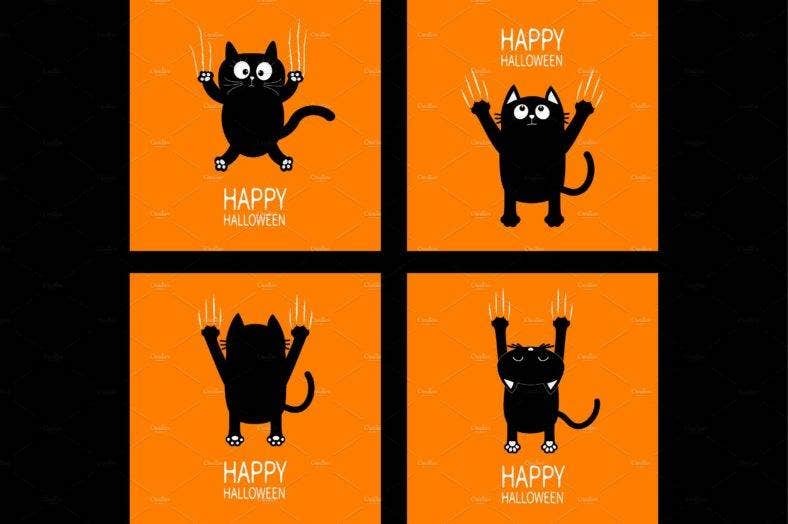 This is another Halloween kitten template. 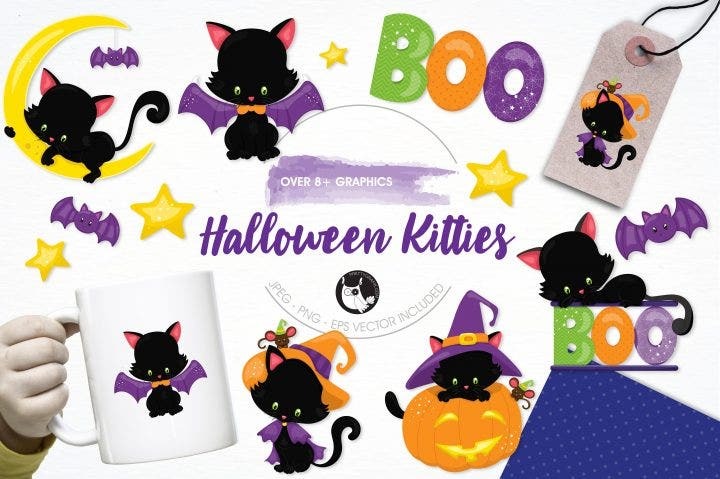 Instead of fear, charm and cuteness are inspired by this Halloween kitties illustration pack. The elements and vector images found in this pack will definitely melt your heart. This pack features eight design elements and is perfect for product design, tag templates, label templates, and so much more. This pack also contains one EPS vector file. Each graphic is saved separately in 6″x6″ 300 dpi, PNG, and JPEG files (transparent background and white background). If you already have your own design and you are having trouble looking for vector images, use this one instead. Once your purchase this template, you’ll get two digital images (.eps10 files). They can be easily resized, they have a transparent background, and are fully editable as well as vinyl-ready. If you have decided to use cats in your Halloween flyer, don’t insert them in the borders or in the background. Use them as the key selling point in your designs. Any animal you insert in your design adds to the visual aspect of it, including cats. Since black cats are typically associated with Halloween, don’t use cats of other colors as you are trying to sell your Halloween event. Furthermore, as you will be using black-colored cats, try balancing it with other colors in your design to make it more attractive. Black, together with white is a neutral color and will make your design dull if you use it too much. 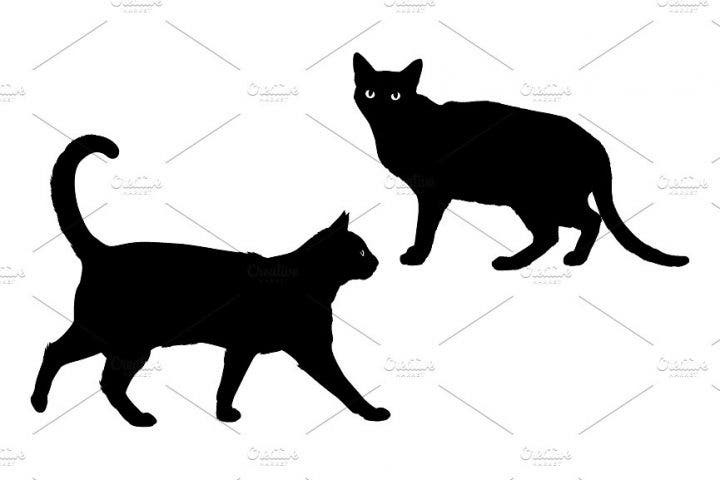 As previously mentioned, since black-colored cats will be used for your Halloween designs, it is better if you have contrasting colors to balance the cat’s very dark hue. Any color matches with black although red, yellow, and orange are preferable to use this Halloween season. Let the cat take control of your design and pair it with other colors in the border templates. It is also advisable to choose designs which don’t all involve cats but also has a combination of other images and designs as well. This is one of the things you should avoid at all costs. Don’t fill your designs with text and make it look like a novel people will have to read. Since your Halloween designs will be used for events, try to limit the text as much as possible and only include the important event details such as the event name, venue, address, and event time. If you are planning to add more text, incorporate them instead in your website templates or social media where you can freely list down in-depth details of your event. 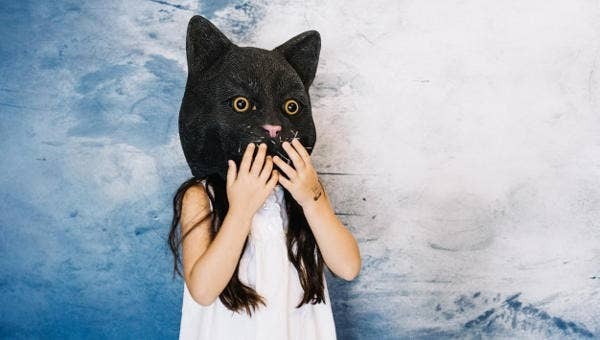 If you have already chosen your desired Halloween cat template but still encounter problems making the final design, try hiring a graphic designer to assist you. Most of the time, downloadable templates are easy to manage as they come with handy instruction manuals to guide you through each step when making the design. Contact an experienced designer or visit a graphic designer if you are having problems with your design especially if instructions are not clear or you feel like the design you made isn’t similar to the one advertised on the designer’s page. Remember that designers are quite expensive, so make sure you get your money’s worth by choosing experienced designers who can easily get your instructions and even finish your design in a span of a few hours. 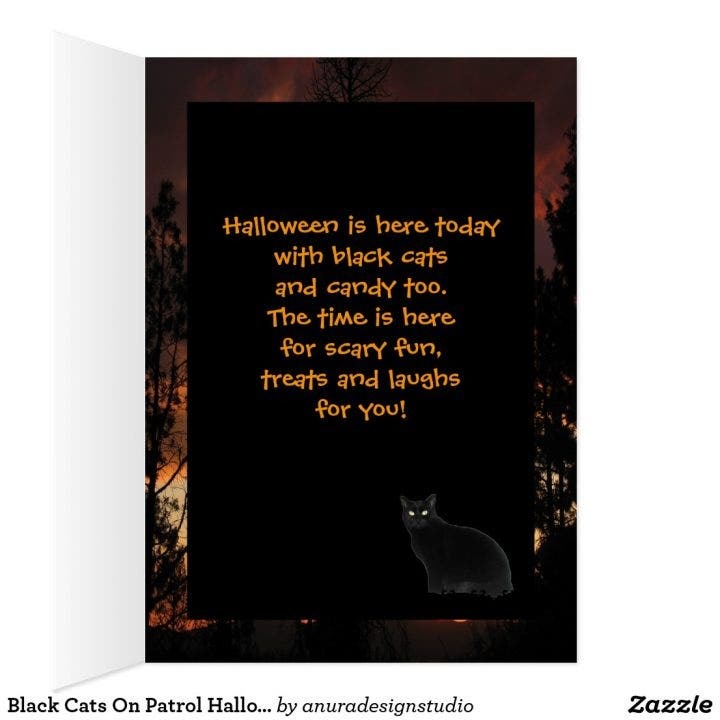 If you’re tired of using your Halloween Themes & Templates, black cats are always available and they add a unique element to your design. Purchase them now before you start your Halloween event!